In Ground Pool Winter Covers - Arctic Armor 15yr. This winter cover is built to last! Constructed of only the strongest Arctic Armor material. Super tough woven triple-laminated polyethylene is the heaviest, strongest and most tear resistant material we can find. This cover features rugged polyethylene thread and anchoring loops as well as UV-protected fabric that withstands sunlight without weakening. The black underside of the cover retards algae growth. Our big 5-foot overlap keeps your cover in place during winters worst. This rugged cover is built the best so it is backed by a 15-year warranty that is 3-YEARS FULL RATED. Invest in America�s strongest winter cover with our Arctic Armor 15 Year Cover. 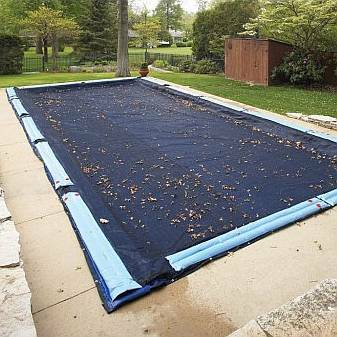 Best polyethylene Winter Pool Cover Period!